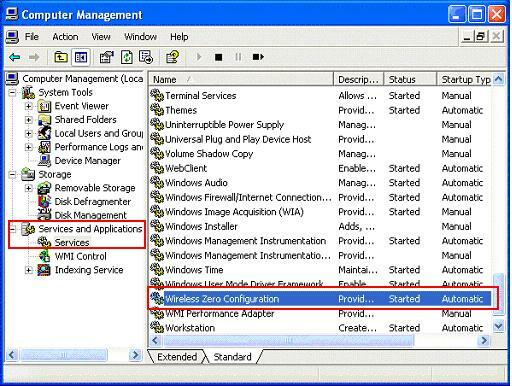 Wireless zero configuration is the feature of Windows XP that allows Windows to detect the available wireless networks and automatically connect to the most preferred wireless network. It is enabled by the Wireless Zero Configuration service in Windows XP. It provides auto wireless network detection when you switch on the computer. 1. Go to Start and right click My Computer. Select and click Manage. 3. Check for the service Wireless Zero Configuration. Make sure that it is started and that the startup type is set to automatic. 4. If it isn't, double-click the service. If the startup type is not set to automatic, click on the dropdown arrow and and change it to automatic. Click OK at last. - The network adapter does not appear as a wireless network adapter in Network Connections. It appears as a LAN adapter, similar to an Ethernet connection. - The properties of the wireless connection do not have a Wireless Networks tab. - You do not receive a Windows XP notification bar message indicating that wireless networks are available. To get the most out of your Windows XP wireless experience, you should contact wireless adapter manufacturer to obtain the latest version of the drivers that support this XP feature. If not, you must manually configure wireless network settings using the configuration software supplied with the wireless network adapter. 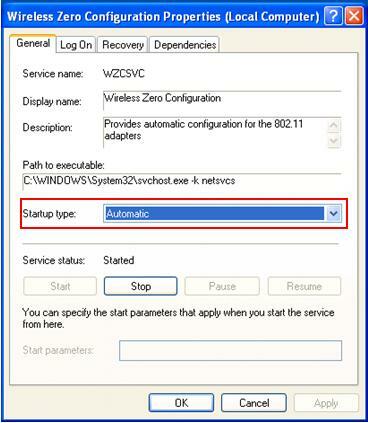 That's all for wireless zero configuration, check out here on checking wireless adapter driver status.